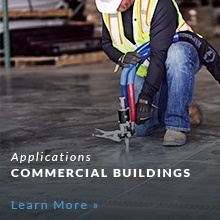 The PolyLevel® System utilizes high-density polyurethane foam to stabilize and level concrete floors and foundations. 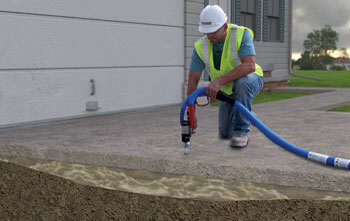 The PolyLevel® System is a state-of-the-art approach to repairing sunken concrete slabs, such as sidewalks, driveways, patios, pool apron decks, garage aprons, and basement slabs. It takes the original concept of mudjacking (slabjacking) and combines it with modern knowledge and technology. Rather than using a mixture of concrete and mud, PolyLevel® utilizes high-density, expanding polyurethane foam to raise slabs back to a desired level. This is done by boring small (penny sized) holes in the slab, and using specially designed equipment to inject a structural grade polymer into the void. After the void is filled, the expanding properties of the polyurethane foam allows for an accurate lift and leveling of the slab. Finally, the small holes are grouted and sealed, and the slab is completely restored. To have the PolyLevel® System used for your concrete lifting and leveling needs, contact your local dealer today! We offer free estimates for our services across the country. Concrete settlement is common and can cause significant problems, including trip hazards, pooling water, and cracks. There are two common causes of concrete settlement. First, concrete is often poured over recently backfilled soil around a home or building during new residential and commercial construction. This soil surrounding the newly poured foundation is actually very loose, and it will settle over time - causing the concrete on top to sink with it. The second cause is erosion of the soil under the slab. As water runs down through cracks and joints in the concrete foundation it washes the soil out as it passes through. This creates voids under the concrete and eventually allows it to settle. Concrete rarely sinks evenly, so cracks are likely to develop as one side sinks faster than the other. Step 1: Small 5/8-in. holes are bored through the sunken slab. Step 2: An injector port is installed in each hole. Step 3: High-density expanding foam is injected into the port, lifting the slab. Step 4: With the port removed, the holes are cleaned and patched with cement. Real Estate professionals tell us that, in today’s market, it is difficult to sell a home with cracked and uneven concrete slabs (flatwork). Left untreated, a home's price may have to be reduced -- often by much more than the cost of the PolyLevel® repair. 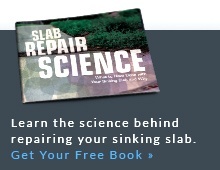 There are several different concrete leveling products to consider when repairing your sunken concrete. You should address your concrete leveling problems immediately to save money and avoid lengthy time-on-market scenarios. Most problems can be fixed quickly, and it all starts with a Free Estimate!